We're all grateful to the wonderful men and women of the Royal National Lifeboat Institute (RNLI) for their dedication and service in saving lives at sea. Fortunately few of our members have ever needed to call on them in anger, but with Mersea and Clacton inshore lifeboats and Walton and Harwich offshore lifeboats all within a very short run of our sailing waters its wonderful to know they are there when we need them. 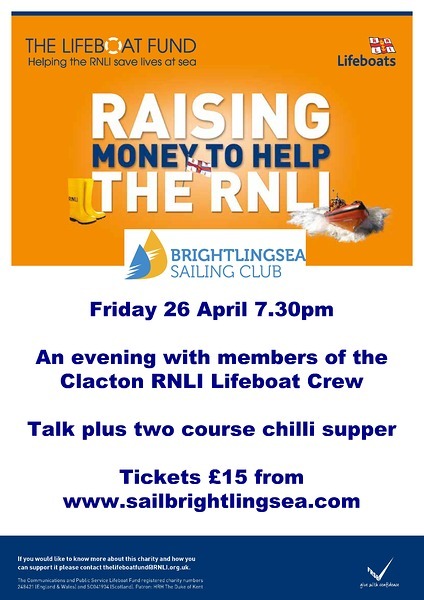 Join us on Friday 26 April at 7.30pm for an evening with members of the Clacton RNLI Lifeboat crew. Learn about what it takes to be a member of the crew, the lifeboat itself and hear some of their amazing stories of courage and determination. A two course Chilli supper (there will be a vegetarian alternative on offer) and the talk cost just £15 with all profits going to the RNLI. You can book your tickets online through the portal or via the bar.